Alex Lynch is an Assistant Professor in Emergency and Critical Care at North Carolina State University, Raleigh, NC. He graduated with honors from the University of Bristol in 2009. After a period in first opinion and referral practice in the United Kingdom, he moved to Tufts University in North Grafton, Massachusetts, to undertake further clinical training in emergency and critical care. He became a diplomate of the American College of Veterinary Emergency and Critical Care in 2015. He worked as a faculty member in ECC before moving to NC State in 2017. His particular interests are coagulation, transfusion medicine, respiratory disease, and trauma. For larger dogs, nasal lines can be easily placed using a cathether inserted via the ventral meatus to the level of the medial canthus. Supplemental oxygen is an important treatment for animals with signs of respiratory distress. 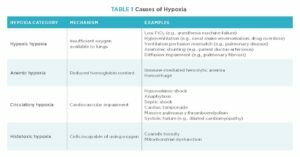 Hypoxia refers to low tissue oxygen concentrations and can occur for several reasons (TABLE 1). Depending on the cause of hypoxia, oxygen supplementation may be very helpful (e.g., for heart failure or pulmonary fibrosis). 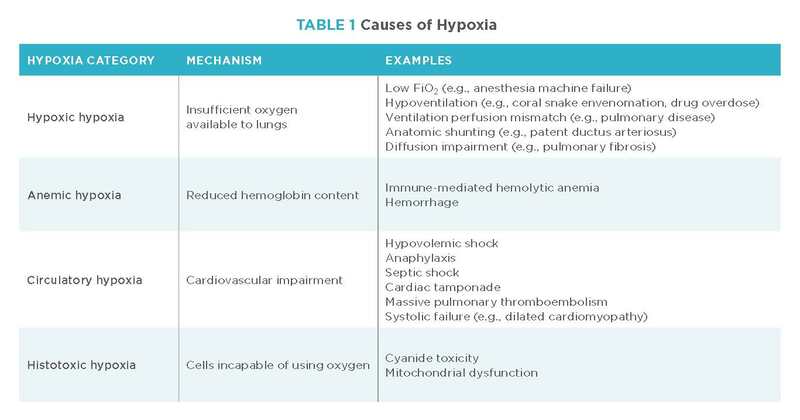 Other causes of hypoxia are not especially oxygen-responsive, however, and require alternative treatment strategies to provide a benefit (e.g., red cell transfusion to an anemic patient). In the short term, oxygen supplementation is always appropriate until further data have been acquired to understand the specific case more deeply. 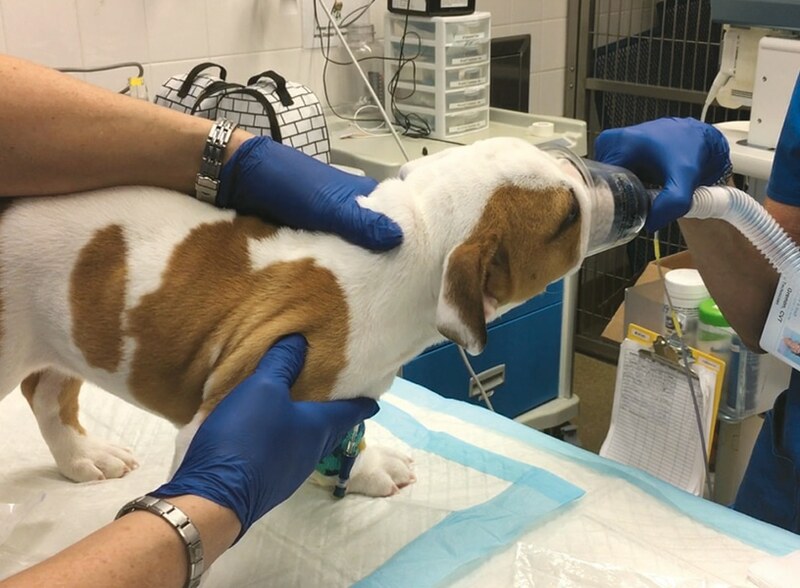 In the long term, oxygen toxicity could occur if an animal is exposed to high concentrations of oxygen for several consecutive days.1 This article concentrates on a practical approach to providing supplemental oxygen to small animal patients. WOULD THIS PATIENT BENEFIT FROM SUPPLEMENTAL OXYGEN? FIGURE 1. Bulldog puppy that had aspiration pneumonia and demonstrated orthopnea receiving oxygen via facemask. In the triage setting, several clues may prompt the clinician to provide oxygen, including tachypnea, shortness of breath and orthopnea (FIGURE 1), cyanosis, and abnormal respiratory noises. With further examination, some of the causes of respiratory distress may ultimately prove to be “nonrespiratory lookalikes.”2 These are patients without cardiopulmonary disease that breathe rapidly or with effort, such as animals with large-volume abdominal effusion, pain, or metabolic acidosis or those that have received certain medications (e.g., opioids or corticosteroids). Quantification of pulmonary function can provide more objective data to support the decision to supplement oxygen. Potential tools include measurement of pulse oximetry or arterial blood gas analysis. Oxygen saturation below 93% and an arterial partial pressure of oxygen below 70 mmHg should prompt oxygen supplementation.1 These monitoring modalities may be inappropriate in animals with profound respiratory distress and rarely change the decision to provide oxygen in more severely affected patients. As mentioned above, it is often reasonable to provide oxygen to critical patients, even if other interventions are ultimately needed to stabilize them. Consequently, oxygen supplementation is often provided while other procedures are performed (e.g., obtaining vascular access, performing pericardiocentesis). Specific noncardiopulmonary disease processes (such as traumatic brain injury) may actually benefit greatly from oxygen supplementation. HOW SHOULD OXYGEN BE SUPPLEMENTED? Several options exist for providing supplemental oxygen. Whenever possible, the least stressful method should be considered, but this should be balanced with the ability to provide as much oxygen as needed with each method (TABLE 2). For short-term oxygen supplementation, it is generally unnecessary to humidify the oxygen; however, long-term exposure of the respiratory epithelium to dry air may promote the development of respiratory infection. Humidification is easily achieved by bubbling oxygen through sterile saline or water. FIGURE 2. 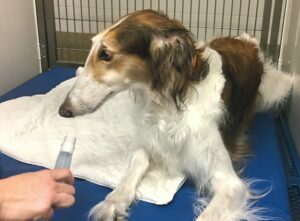 Borzoi undergoing flow-by oxygen administration. An easy method to provide supplemental oxygen is to hold oxygen tubing close to an animal’s face (FIGURE 2). This modestly enriches the fraction of inspired oxygen (FiO2), but potentially only a few points above room air (25%) up to approximately 40% if high oxygen flow rates are used (2 to 3 L/min). Flow-by oxygen is not well tolerated by all patients, however, and could further contribute to anxiety. This approach is impractical for any protracted period and is best suited before induction of anesthesia or while procedures are being performed. FIGURE 3. Mixed-breed dog sedated for bandage change receiving supplemental oxygen via facemask. Oxygen administered via facemask is another simple technique but again may not be tolerated in anxious patients. The FiO2 achieved will vary depending on how tightly fitting the facemask is and the flow rate administered. 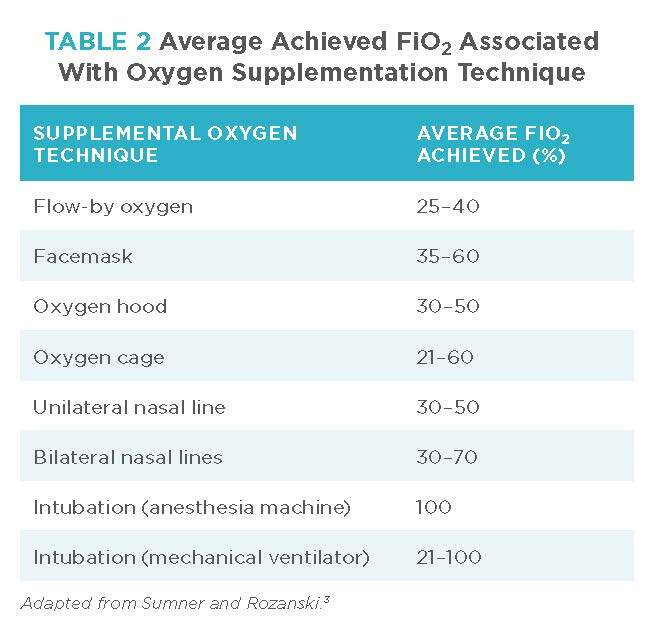 Higher oxygen flow rates (e.g., 2 to 5 L/min) are recommended to achieve an FiO2 of 35% to 60%.3 Rebreathing of carbon dioxide can occur with more tightly fitting masks, and periodically switching out the mask is recommended.1 Facemasks are also convenient for oxygen supplementation to dogs undergoing procedures (FIGURE 3). Oxygen hoods can be created with the use of hard e-collars, cellophane wrap, and tape. The hood is covered in the cellophane wrap and secured in place with tape, with a small portion left open for ventilation. Pliable oxygen tubing is fed into the hood from the collar and secured in place. The hood must be saturated with higher flow rates of oxygen (e.g., 1 to 2 L/min) before the rate is reduced to 0.5 to 1 L/min. This should achieve an FiO2 of 30% to 40% if a tight seal is created. In general, patient compliance is good. The biggest challenges with this technique involve excessive humidification and poor ventilation if too small of a gap is left in the cellophane wrap. This technique is used less commonly in hospitals that prefer alternative, more convenient techniques (e.g., oxygen cages). FIGURE 4. Bulldog in rigid acrylic glass oxygen cage. 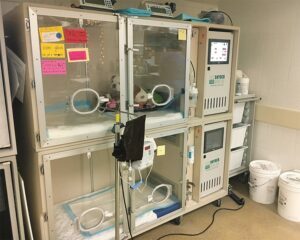 Oxygen cages are a very convenient and efficient method of supplementing oxygen to small animal patients. Several variants are commercially available, including flexible options made of polyvinyl chloride and acrylic glass boxes (FIGURE 4). Similar to the challenges of oxygen hoods, control of temperature, humidification, and ventilation is of paramount importance. More sophisticated and expensive models enable climate control and have soda lime systems in place to prevent rebreathing of carbon dioxide. One advantage of oxygen cages is the physical separation of the clinical team from the patient. This can be helpful in animals for which handling could worsen anxiety and respiratory distress. A disadvantage of this approach, however, is the potential for missing alterations in audible respiratory noise in select patients (e.g., upper respiratory obstruction). Animals with respiratory embarrassment are at risk for potentially fatal decompensation with stressful handling. Observation from a distance can also be helpful to characterize abnormal breathing patterns that may be missed with close hands-on examination. Characteristic breathing patterns may help to localize the anatomic location of respiratory disease in the specific patient (e.g., short, shallow breaths are common with pleural space disease, and increased expiratory effort is common with lower airway disease). FIGURE 5. 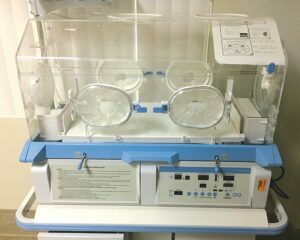 Incubator used for neonatal and pediatric patients. 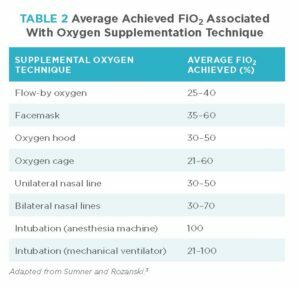 More sophisticated oxygen cages frequently enable the clinician to adjust the approximate FiO2 administered to the patient, ranging from room air (21%) to approximately 60%. The actual concentration achieved will depend on the integrity of the cage itself, with air leakage reducing the concentration. This is also true when the cage door is opened, resulting in a rapid drop of the oxygen concentration. This also limits the usefulness of this approach when frequent patient reassessment would be ideal. Another convenience of the oxygen cage is the ability to perform nebulization without close handling. Oxygen cages are limited by their relative expense (including setup costs and requirement for oxygen cylinders); patient size also limits their utility (e.g., larger dogs are not ideal candidates for oxygen cages). 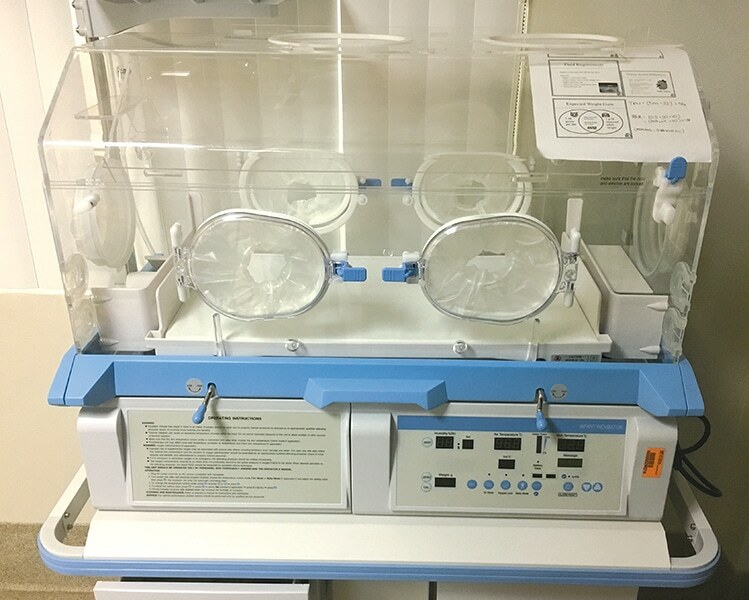 For neonates and pediatric patients, incubators can be used in a similar manner, either with already piped-in oxygen or through placement of oxygen tubing into the incubator itself (FIGURE 5). Oxygen cages are a very convenient and efficient method of supplementing oxygen to small animal patients. FIGURE 6. 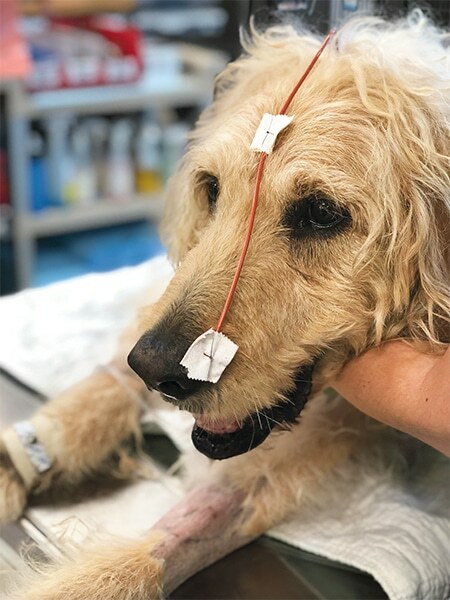 Labradoodle with spontaneous pneumothorax demonstrating correct securement of a red rubber nasopharyngeal line. For larger dogs, oxygen cages may be too confining to be comfortable. The placement of nasal lines can be convenient in such dogs. Nasal prongs can be used but reasonably are relevant only in nonbrachycephalic breeds. The FiO2 achieved via nasal prongs is not well established but may be similar to that seen with longer nasal catheters, provided the patient does not dislodge the prongs. In most circumstances, nasal lines can be placed easily by using 5- to 8-French red rubber catheters. Local analgesia should be instilled in the nose (e.g., proparacaine eye drops), before a lubricated red rubber catheter is inserted via the ventral meatus to the level of the medial canthus. 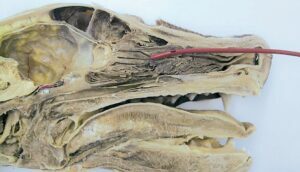 The catheter can then be sutured to the nostrils and face to secure the tube (FIGURES 6 and 7). Alternatively, the catheter can be measured to the level of the mandible for the placement of a nasopharyngeal catheter (FIGURE 8). FIGURE 7. Cadaver image indicating the approximate termination of a red rubber catheter used as a nasal line measured to the medial canthus. Nasal lines may be of limited value in brachycephalic breeds. An alternative technique for recovery from anesthesia in these breeds is the placement of nasotracheal oxygen.4 In these cases, a red rubber catheter can be placed extending from the external nares and directed into the trachea, before removal of their endotracheal tube. A red rubber catheter is placed from the external nares caudally, with sufficient length to enter the proximal trachea. With the dog in sternal recumbency, the catheter is advanced until it is visible just beyond the soft palate. 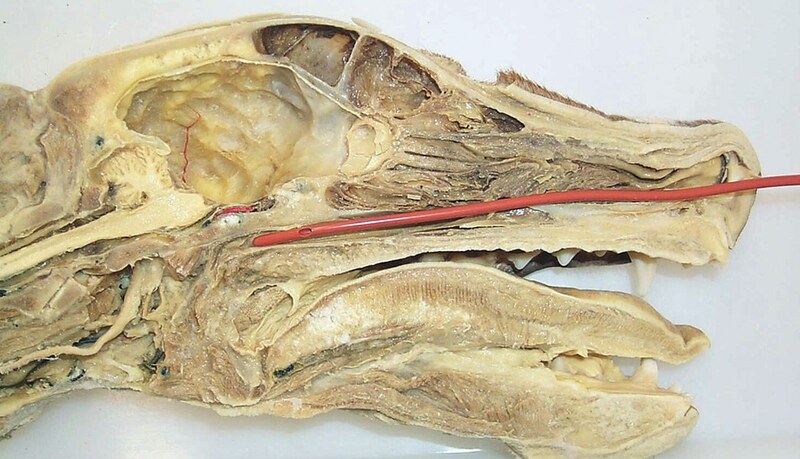 The catheter is then exteriorized through the mouth using long forceps before being redirected into the trachea. It is secured in a similar manner to the nasal lines as described above. 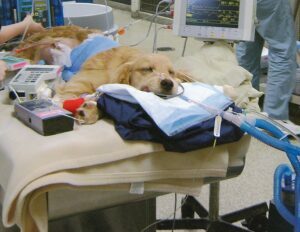 When the dog is recovered from anesthesia and no longer requires further oxygen supplementation, the tube can be easily removed. FIGURE 8. Cadaver image indicating the approximate termination of a red rubber catheter used as a nasopharyngeal catheter measured to the mandibular ramus. Intubation with 100% oxygen may be necessary in severe cases of upper airway obstruction (e.g., laryngeal paralysis crisis). Not every case with an upper respiratory crisis necessarily requires intubation. In cases refractory to other measures of oxygen supplementation (e.g., sedation and anxiolysis, noninvasive oxygen supplementation), timely endotracheal intubation can be a life-saving measure. Rapid induction of anesthesia is desirable to ensure efficient intubation. Propofol is an excellent induction agent but is associated with profound cardiorespiratory depression. It may therefore be sensible to premedicate the animal if time allows or to perform coinduction with another drug class (e.g., a benzodiazepine) to reduce the dose of propofol required. In cases of profound respiratory distress that are secondary to underlying cardiac disease, propofol may result in severe cardiovascular depression with risk for cardiopulmonary arrest. In such cases, depending on the patient’s level of excitement and anxiety, sufficient sedation may be achieved with alternative drugs to propofol (e.g., midazolam 0.3 to 0.5 mg/kg and butorphanol 0.2 to 0.3 mg/kg) or may dramatically reduce the dose of propofol required needed to achieve intubation. It is also sensible to examine laryngeal function in dogs with upper airway obstruction under a light plane of anesthesia. FIGURE 9. 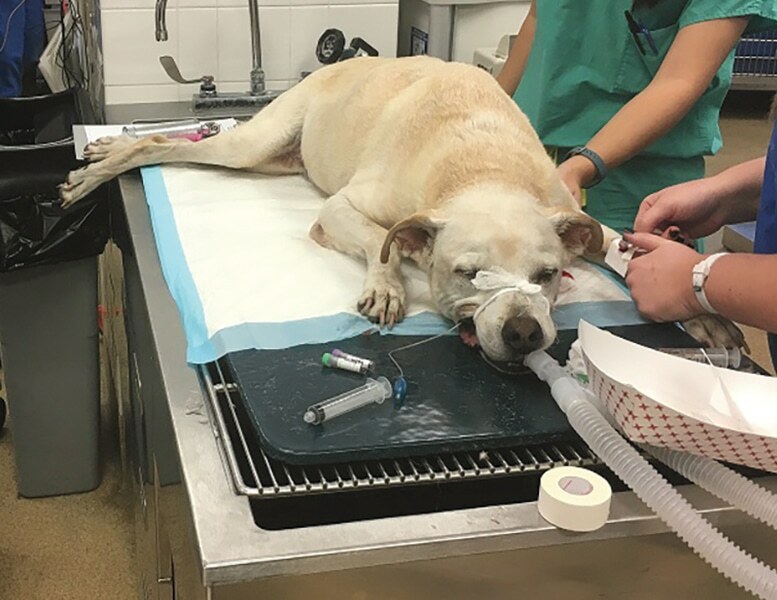 Geriatric Labrador retriever mix intubated after an upper respiratory crisis associated with laryngeal paralysis. In cases of upper respiratory obstruction associated with laryngeal paralysis, only a short period of intubation is typically necessary because the patient should retain the capacity to ventilate spontaneously (FIGURE 9). During this period of intubation, additional diagnostic and therapeutic measures then can be performed (e.g., chest radiography, external cooling, administration of corticosteroids). If the abnormality present is nonreversible or severe, intubation may be necessary for a prolonged period until a curative solution (e.g., surgery) has been performed. In some situations, the upper airway may be bypassed via placement of a temporary tracheostomy tube. This allows the pet to be recovered from anesthesia and potentially obviates the need for supplemental oxygen if the remaining respiratory tract is functioning normally. FIGURE 10. Puppy with pulmonary contusions after being hit by a car receiving mechanical ventilation. Cardiovascular instability, such as that noted in animals recovering from successful cardiopulmonary resuscitation. Long-term oxygen supplementation is associated with the risk for oxygen toxicity. One advantage of using mechanical ventilators is the ability to control the FiO2 accurately to as low as 21%. Mechanical ventilators also offer some other options for improving pulmonary function, including the provision of positive end-expiratory pressure to facilitate airway opening and improved gas exchange. Supplementing oxygen reliably and safely is a vital and potentially life-saving intervention in small animal medicine. The specific techniques used depend on the situation at hand, as well as the equipment available. An awareness of several techniques is clinically helpful. Mazzaferro EM. Oxygen therapy. In Silverstein DC, Hopper K (eds). Small Animal Critical Care Medicine, 2nd ed. St. Louis, MO: Elsevier Saunders, 2015, pp 77-80. Lee JA. Nonrespiratory look-alikes. In Silverstein DC, Hopper K (eds). Small Animal Critical Care Medicine, 2nd ed. St. Louis, MO: Elsevier Saunders, 2015, pp 157-160. Sumner C, Rozanski E. Management of respiratory emergencies in small animals. Vet Clin Small Anim Pract 2013;43(4):799-815. Senn D, Sigrist N, Forterre F, Howard J, Spreng D. Retrospective evaluation of postoperative nasotracheal tubes for oxygen supplementation in dogs following surgery for brachycephalic syndrome: 36 cases (2003-2007). J Vet Emerg Crit Care (San Antonio) 2011;21(3):261-267.